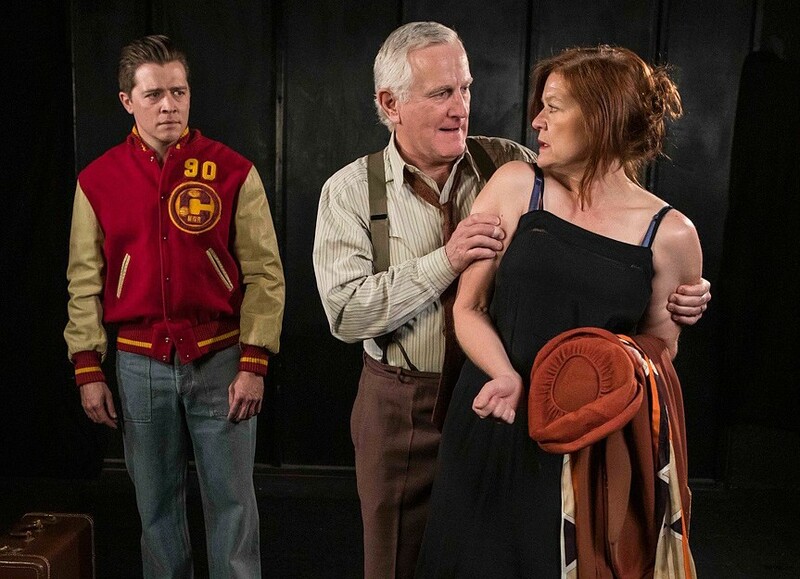 Trevor Peterson as Biff Loman eyes his father and mother as played by Henry Woronicz and Gigi Bermingham in Ensemble Theatre Company’s revival of Death of a Salesman. “Where did it all go wrong?” This plaintive question lies at the heart of the hero’s dilemma in Arthur Miller’s classic play Death of a Salesman. 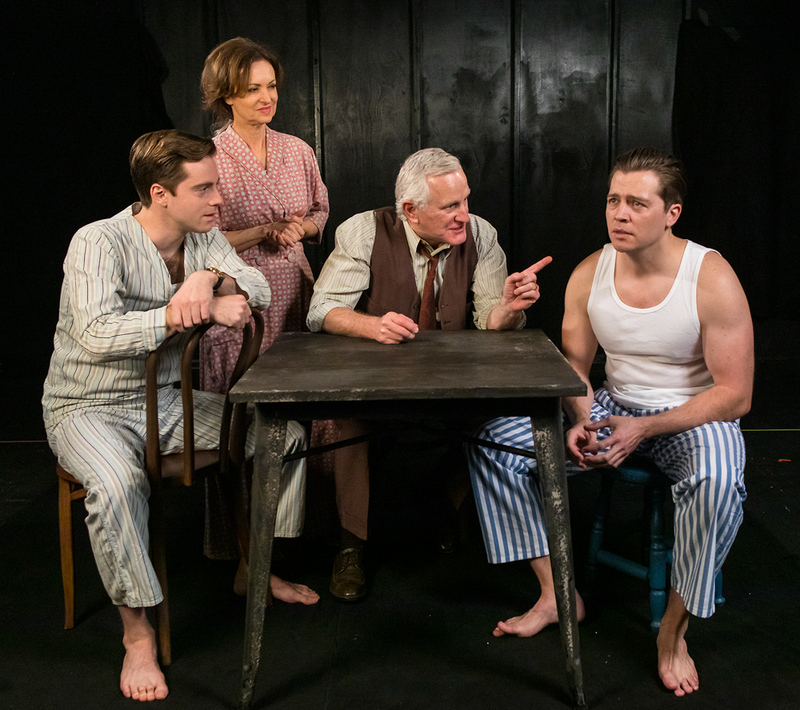 For Willy Loman, the promise of the American dream appeared to be a sure thing, safe as a three-score lead at the two-minute warning. But as the years have passed and his athletic star sons, Biff and Happy, have turned out to be less than stellar when it comes to earning a living or settling down and raising families, Willy has learned the hard way that his vaunted likability no longer guarantees an income, or even a welcome. While the pain of middle-class disenfranchisement may have been a new subject for tragedy when Death of a Salesman premiered in February 1949 (new enough to require Miller to write a famous op-ed in the New York Times to justify it), 70 years later it is a driving force in popular culture and national politics, the sad and angry face that launched untold thousands of bright-red MAGA hats. It is entirely fitting then that Ensemble Theatre Company (ETC) should choose to revive the play in 2019 and attempt to bring it fully into the 21st century through a combination of craftsmanship and theatrical imagination. ETC founding director Joe Hanreddy will helm the production, which opens this weekend and runs through February 24 at the New Vic. In mounting a fresh version, Hanreddy told me that although the play requires “past and present to live simultaneously in the mind of the protagonist,” his team aims to “escape the weight of tradition” when it comes to imagining how the work should be staged. In what is perhaps the most radical of the new production’s features, three of the cast members who are also musicians — Sarah Saviano, Sergi Robles, and Jenn Chandler — will perform a new original score live onstage during the performance. Alex North’s dramatic modern music was a key element in the play’s 1949 Broadway production under director Elia Kazan, and Hanreddy expects that the new score by Barry G. Funderburg will play a similar role in distinguishing the show’s shifting modes from conventional stage naturalism. 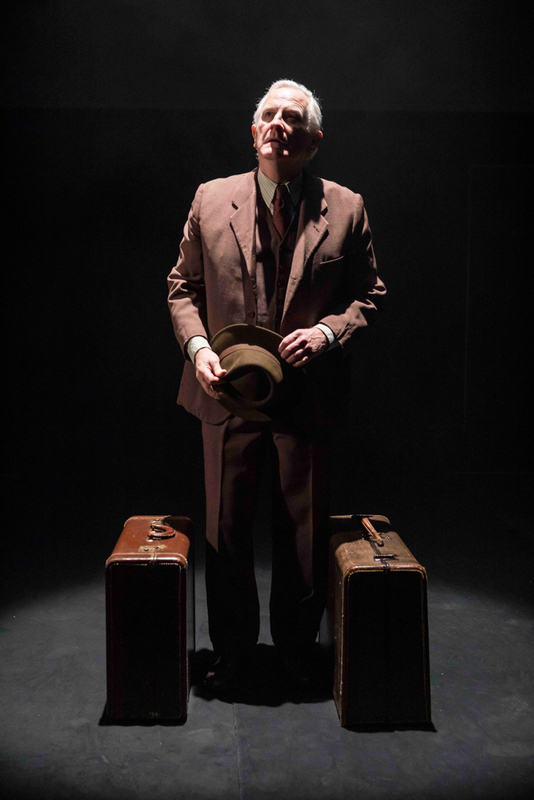 For Henry Woronicz, the actor who will play Willy Loman, the role represents the culmination of an impressive lifetime in the professional theater. An accomplished director as well as an outstanding performer, Woronicz spent many years at the Oregon Shakespeare Festival in Ashland, where he served as artistic director from 1991 to 1995. He describes his character’s moral arc as “Willy looking back to see where he took the wrong turn.” Plagued by mental confusion that contemporary audiences may interpret as incipient dementia, Loman struggles to reconcile his younger expectations with the grim reality of his present helplessness. Although “the family issues that Willy faces strike us in a universal, contemporary way,” according to Woronicz, the play also “probes the contradictions of capitalism” with a political combativeness that springs from the specific circumstances of postwar American life in which Miller wrote it. Given Death of a Salesman’s acknowledged status as an all-time American classic and a staple of high school English curricula, it’s easy to forget that the play represents a significant formal experiment on the part of the playwright. Billed as Certain Private Conversations in Two Acts and a Requiem in the script’s subtitle, it contains many subtle shifts in time and perspective. Director Hanreddy said that he has worked with scenic designer Se Hyun Oh on a set that will make these changes from past to present “as visceral as possible.” Combined with the use of actor/musicians and what are sure to be fine performances from a cast that includes area favorite Michael Bernard, this promises to be a very special experience in the theater, and one worthy of taking its place in the canon of great Death of a Salesman productions. Ensemble Theatre Company’s production of Death of a Salesman opens Friday, February 8, and runs through Sunday, February 24, at the New Vic. Call (805) 965-5400 or see etcsb.org.